SAN FRANCISCO – July 18, 2014 – Castlight Health®, a pioneer in the Enterprise Healthcare Cloud, has further expanded its technology platform through a relationship with Teladoc, the nation’s first and largest telehealth provider with more than 8 million members. This relationship enables Teladoc to offer its telehealth services through Castlight’s technology suite to all enterprises that work with both Castlight and Teladoc. Castlight empowers large businesses to manage healthcare spending and enables employees and families to make informed choices with a clear understanding of costs and likely outcomes. Teladoc provides access to U.S. board-certified, state-licensed physicians who can treat many non-emergency medical issues, such as allergies, bronchitis, skin rashes, flu symptoms and pink eye, via phone, secure online video, and mobile app. By offering affordable and convenient access to quality care – without leaving the home or office – Teladoc significantly reduces the utilization of more costly alternatives, such as emergency rooms or urgent care facilities. As a result, unnecessary ER or urgent care visits for minor conditions can be dramatically lowered. It is estimated that a Teladoc consult, at a $40 charge, can save an average of $90 compared to an urgent care center visit and more than $1,400 compared to an ER visit. “Teladoc’s relationship with Castlight is designed to deliver significant value for large employers nationwide by helping their employees seek lower cost, higher quality options instead of the ER or Urgent Care Center when their doctor is unavailable. The Castlight relationship is in line with our recent strategic alliances and partnerships as Teladoc continues to expand and grow as a leader in healthcare,” said Jason Gorevic, CEO of Teladoc. Integration of Teladoc into Castlight further amplifies the proven benefits of telehealth services. For those individuals whose employers offer Teladoc within the Castlight technology suite, an alert will appear in Castlight when users conduct a search for a relevant medical service, such as an ear infection or sore throat. The alert prompts the individual to opt for telehealth and provides an immediate click through to access the Teladoc service. Castlight demonstration version. Prices have been changed to maintain confidentiality. Future product concepts subject to change. 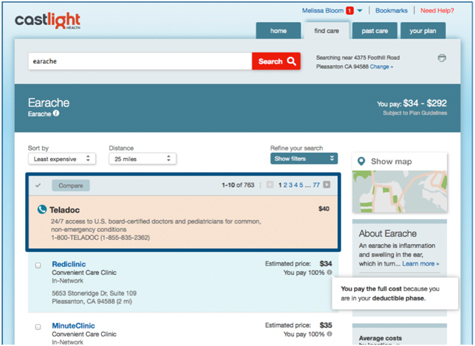 Castlight Connect Mobilizes the Healthcare Ecosystem Teladoc is one of many companies to integrate with Castlight through the Castlight Connect Solution Center, one of four Solution Centers that comprise the Castlight Enterprise Healthcare Cloud. These third-party integrations enable employees to discover and access services such as telehealth providers, Health Savings Account providers, on-site clinic providers, and other expert opinion services. Castlight Connect also has integrations with advocacy services, wellness solutions, decision support applications, and appointment scheduling solutions. Deploying this Castlight Solution Center empowers businesses to move away from a fragmented set of underutilized vendor programs to providing a “one stop shop” for employees. Employees can then better take advantage of these resources when they need them, thereby increasing the programs value to the employee and return on investment to the employer.